The Addams family is the story of an old noble family with an enormous fortune, a slight supernatural touch, and a distinct taste for the macabre. It started as a series of cartoons in The New Yorker, saw several adaptations as tv-series, video games, and feature films. It is the first one of the latter we’re spotlighting today. Directed by Barry Sonnenfeld, now most famous for the Men in black trilogy, it hit the cinemas in 1991 and was a huge financial success, making ten times its budget at the box office. Its plot it centred on Gómez trying to bring his brother Fester back from the dead and a loanshark’s attempt to profit from this and from the likeness of her adopted son to the lost sheep. 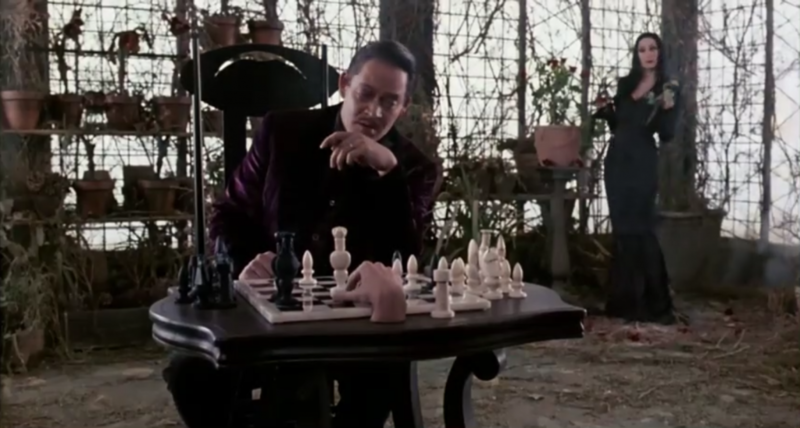 This still comes from the beginning of movie and shows Gómez playing against one of my favourite sentient severed hands in all of fiction, Thing. But Gómez is not really paying too much attention to the game. His mind is occupied with his brother Fester and his feelings of guilt for their separation. His loving wife Morticia is trimming the roses – that is, she’s cutting the flowers of their stems – and trying, with little success, to cheer him up a bit. Thing is impatiently waiting for a move. That rook on b7 is cleverly hiding behind black’s king in the picture above but can be spotted in the different camera angle we get a few minutes later. Which leads me to the obvious question: what the hell happened here? A reasonable position? On my blog?! I never heard of such a thing! And in an Addams family movie! That’s where I would expect a weird, slightly off-putting position with a large amount of black pieces on the board. But no, the position is actually quite plausible. 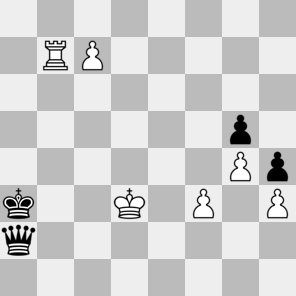 Probably, white’s king was on c1, black promoted a pawn on a1, white played Kc2, black answered Qa2+, and white played Kd3. Black is winning, mainly because he has Qd5+, winning the rook on b7 and, in fact, mating in 14.2 Without this move, it would actually not be such an easy win. And Thing makes it even harder! Profiting from a momentary distraction provided by the arrival of the Addamses lawyer, he sneakily puts the white rook standings next to the board on f1. This, in fact, makes the position drawn. Realism: 4/5 Seriously. In an Addams family movie! These are strange times we’re living in, my friends. Probable winner: That depends entirely on how perceptive Gómez is. If he notices Thing’s deceit, he has very good winning chances. If not, it will probably be a draw.